My girls are in love with the name of this gorgeous Heirloom annual, so the seeds are in the fridge chilling for a couple of weeks before I plant them. 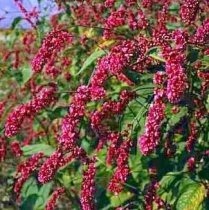 I've had some seeds arrive that I ordered online to get my Spring seed planting a kick start. I'd saved a fair few seeds from the garden last summer as well so I should be pretty set. I've planted some in seedling trays but I really need just slightly warmer evenings before I tackle the rest of the seeds. I've gone for a very electic mix of seeds - from Vegetables (Celeriac, Rainbow Carrots), to medicinal herbs (Motherwort), flowers and and Bee attracting plants (Bergamot), and many more that I haven't listed. I was reading littlewoollie's blog yesterday and she was talking about her chickens laying very odd sized eggs - I'm having the same thing with ours. One of out older hens laid an egg the size of a quail's the other day. It was very odd inside (possibly she's getting a bit old to lay now??) The girls thought it was pretty funny though. We've had a couple of bigger than usual ones as well. Mmmmm the Chicken, Leek and Mushroom pies I made for lunch earlier this week were divine - will be making those again for sure. Amazing what you can throw together when you think you have nothing left in the cupboard or fridge. Anyway, a certain Rugby World Cup has been taking over our wee nation this last week or so. The hubby is a huge rugby fan so my girls have been right into it as well. I made them All Black cupcakes to kick off the action last week - they were a bit of a rushed job but the girls loved them. 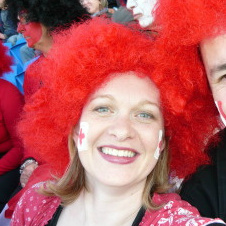 We went to a game here in our little city the other night - Canada vs Tonga. We have no affiliation to either team but everyone was loving supporting both teams and we were all dressed in red. My lovely friend Leah (from whydidntanyonetellme ) sent me a photo that she had taken of us on TV and I was actually sending her a text message at the very time I was on TV. Here is another photo of just me that shows how crazy I looked that day!! Such fun! Must go and get dinner on for the kidlets and us now - yay it's the weekend. Time to get some baking done (it's the little ones 4th birthday on Sunday, I really need to get the party food organised) and I'll try and get the crochet hook back out! Such fun indeed - ha ha!!! Great egg pic - what a scream. It must be so amazing to just wander out and grab your own eggs each day. Hope you wangle a bit of time to get your hooks out hon.